Alpinetop Green Spiral is a newly-designed smoking pipe. 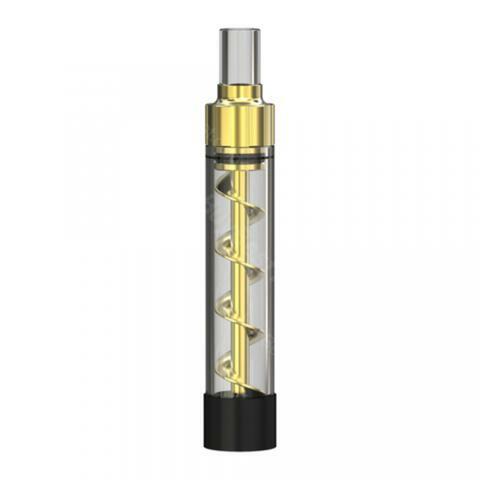 With its borosilicate glass chamber, you are capable of packing anything you want in and twist the screw counter-clockwise into the tube. Alpinetop Green Spiral is a newly-designed smoking pipe. With its borosilicate glass chamber, you are capable of packing anything you want in and twist the screw counter-clockwise into the tube. After that, all you need to do is light the end and puff, puff, puff away. With every twist of the mouthpiece screw, the ashes will fall, leaving you access to fresh material ready for your next puff. The internal air path provides fresh flavor with every twist. The replaceable cotton filter is efficient in keeping those pesky ash hits at bay. It also comes with a water pipe adaptor to fit your different vaping needs! 3 colors. • It doesn't come with tobacco, please buy them separately. Alpinetop Green Spiral is a uniquely twisted glass pipe. It has a fully isolated air path to ensure the highest quality experience, using a borosilicate glass chamber and glass mouthpiece to provide pure flavor and strength.